You may know that Valve recently added in a new item to Team Fortress 2. The Nine-Pipe Problem. What you may not know is the person behind it: Mnemosynaut. No I can’t pronounce his name either. But that doesn’t stop him from being a big part of the model making community. He currently has 2 in game items, as well as having a hand in fake updates “Night of the living dead” and “The Medieval Update”. We took the opportunity to chat with him about his work. Hi Mnemosynaut. This week you had an item of yours added into Team fortress. The Nine-pipe problem. Many people think that this is your first item thats in the game. But its not is it? Apart from that, I also contributed the six team-colored paints that were added in the Uber Update. I was never officially acknowledged for those, of course, but I still brag about them in interviews nonetheless. As you should. How does it feel having some of your work actually in the game for everybody to see? It has its pros and cons. The upside is that I get a lot of compliments and support from players in-game. The downside is that I have apparently turned into a magnet for Russian and Brazilian children on Steam. In fact, while typing this sentence, I just received a friend request from yet another Russian who probably communicates through Babelfish and will inevitably ask for free items, only to turn on me when I decline and proceed to spam my workshop pages with incomprehensible profanity. Where did the design for the Nine-pipe problem come from? Even though I only made it a few weeks ago (it’s the fastest item to ever be implemented directly from the workshop, by the way), I don’t really remember. 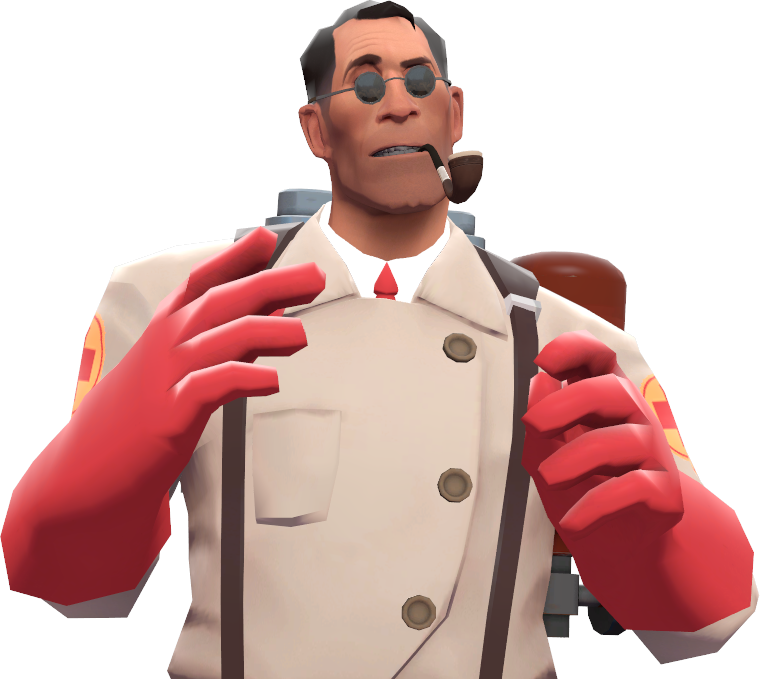 I think I was looking on the Medic’s wiki page for inspiration and noticed the Private Eye. Then I said “okay, pipe” and it was done. The dark lenses were a complete afterthought and I only added them when I realized how bare and uninteresting a pipe is by itself. When you think about it, all of the other pipe items in-game are coupled with another accessory (the Dr. Grordborts beard, the Sniper’s sweater vest, etc). You may have designed it with the private eye in mind, but did you ever thing valve would combine them and make “Eliminating The Impossible”. In the workshop submission, I included a small promotional image containing a Sherlock Holmesian-style silhouette of the Medic wearing both the pipe and Private Eye. That, along with the Holmes reference in the original name, should make it obvious that I was looking at the Private Eye from the start. I definitely did not expect Valve to combine them into a set, seeing as how the hat was made by someone else. This is, in fact, the first time two people have unwittingly collaborated on an item set. It was a pleasant surprise. You mentioned the Holmes reference in the name. It was originally called “The Baskerville Case”. How do you feel about valve changing the name to the “Nine-Pipe Problem”? Lately, for one reason or another, Valve has been coming up with original names for items they implement into the game rather than using the names that the creators submit. A few people have guessed that it’s because Valve doesn’t want to seem like they’re just copy/pasting the item without having any creative input, which is perfectly fine. Some of the changes are for the worse (see: Itsy Bitsy Spyer) and some are for the better (see: Snapped Pupil aka the best-named item in TF2). In the case of the pipe, I’d say that I like the new name pretty much equally to the original. I strongly approve of the description they gave it, however. Am I right in thinking that you were a big part in the making of the night of the living Update pack? A huge amount of effort was put into the Night of the living Update and medieval packs. How do you think it went? The Medieval Update was a disaster. It was a horrible experience, through and through. The biggest mistake we made was in not asking enough people to help out, so as time went on and we began to understand the scope of the project, the workload became far too much for three people to handle. In the end, the Medieval Update acted mostly as a proof of concept and so we had a lot more people interested in contributing when we started on the Night of the Living Update. Are you planning on doing any more packs? Any chance of a sneak peak? We have at least two planned for 2012 but we haven’t really gotten anything off the ground yet. One idea that’s been tossed around for a good while now is something called the “Power Struggle Update”, which would feature items based on the various forms of energy (electric, nuclear, solar, etc). If that happens, it will probably be in the Summer. 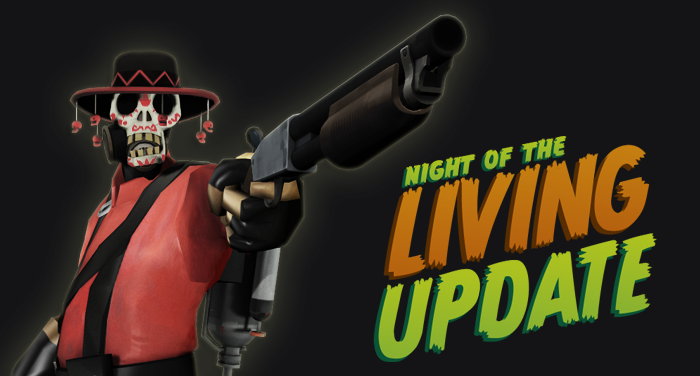 I’d also really like to do a followup to Night of the Living Update for this year’s Halloween. I think there’s a lot of untapped potential for creativity there and we could feasibly do one every year for as long as people are still interested in TF2. You obviously put a lot of time into Team Fortress, but how much do you actually get to play the game? I still play nearly every day. Single-player games come and go but no other multi-player game has captivated me like TF2 has for the past 3+ years that I’ve been playing. I picked up 3D modeling precisely because I wanted to contribute to my favorite game, and now that it’s beginning to really pay off, I don’t think I’ll be leaving anytime soon. As long as Valve is still supporting TF2 and operating the workshop, you can expect me to be a part of it. Clearly you are good at what you do. Have you thought of taking this further and possibly making a career out of it? My plan right now is to work on improving my modeling and texturing skills so that I can eventually get to the point where I’m able to make a career out of it. You might think that having two items being acknowledged by Valve would imply that I’m good but they are both very simple models that any amateur could make without a whole lot of experience. I hope to start taking some 3D Design classes in the Fall so I’ll have to wait and see where that takes me. Thank you very much for this quick chat. How can people see more of your work? Subscribe to my workshop! I’ve been really active lately and I try to produce at least 1-2 items every week. The problems with people that asks for free items… Nothing is free in this world, know it.